Servo technology provides precise control of hydraulic systems, including the position, pressure, force and velocity of all sub-systems. The core of servo systems is an electro-hydraulic servo valve, which, upon instruction from a digital control panel, controls how hydraulic fluid actuates sub-systems. Servo mechanisms use error-correction to keep errors in operation as close to zero as possible. Zero errors (or close to zero) as defined by the programming software mean pinpoint accuracy. Due to this nearly infinite control of the operation of the mechanical components, excellent energy savings can be achieved, as components are only activated when called for and “at rest” between operations. 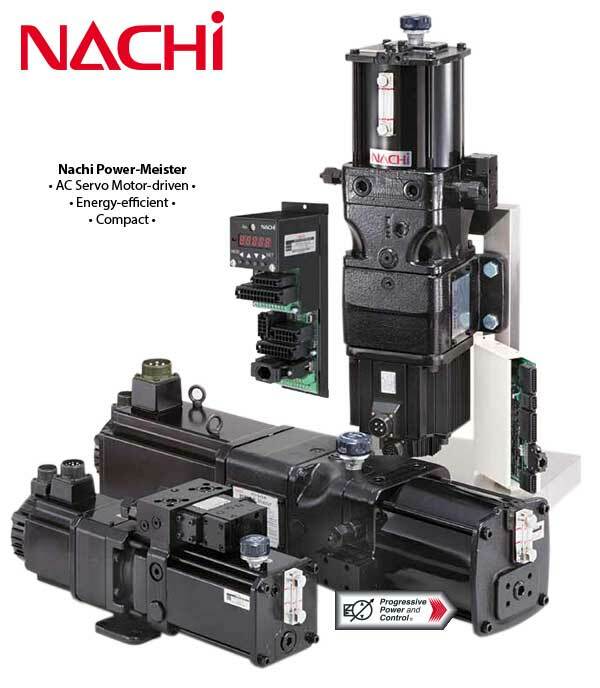 The Nachi AC servo motor, through the use of a digital servo controller, precisely adjusts the position and pressure of the pump and its rotational speed. The electrically-controlled hydraulic system offers great energy efficiency by generating flow, pressure and positioning as dictated by the needs of your operation, but then stops during idle times, giving you precise repeatability with energy savings and reduced noise. Servo pump operates only as needed for energy savings and reduced sound output. Precise control by high-speed calculation of the servo controller makes accurate, repeatable positioning within 0.001mm or 0.000039" possible. All-in-one compact design saves space - available in vertical or horizontal positions. AC servo motor, hydraulic pump, reservoir, relief valve and other valves are included in base unit. 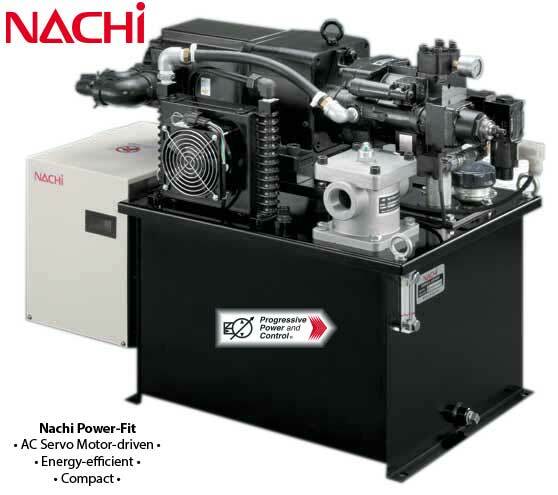 The Nachi Power-fit uses two variable displacement piston pumps driven by an AC servo motor for precise pressure and flow control. The Nachi pump models used are the PVS and PZS pumps. The power unit is customizable with 16 combination settings of pressure and flow utilizing a digital control panel.